Do your children have all the pens and pencils lying around? Do you have several pens in his room but as if there? Maybe they need a more attractive object that captures their attention and used to have the room a bit more orderly. 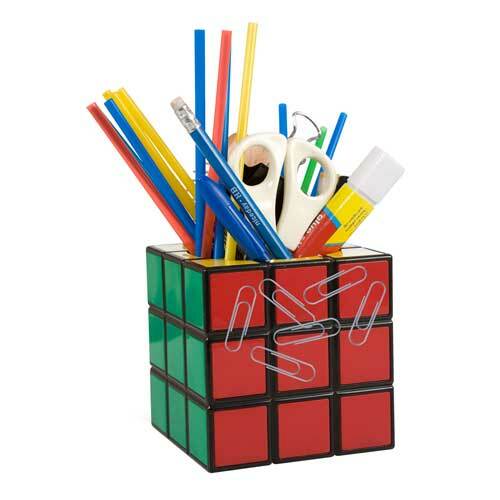 This Rubik Desk Tidy is the answer to your desires. A tribute to the famous cube created in the 70s by Hungarian architecture professor who gave name and that was a real boom at the time. Perhaps your children are too young to know. So, Give them this object, and incidentally, tell your story. They say that he is the best selling toy in history. How can a color cube has that record? Simple and attractive in appearance, but with great complexity in design, this Magic Cube quickly became an addictive hobby for millions of people worldwide. Painted six colors, parts can move through internal axes. The objective of the game is simple: return the cube to its original position with each side of a single color. Objective simple but complex solution. We could also leave it as is and would always solved the riddle ... But you know how people are. We like challenges and the Rubik's Cube has been one of the great challenges of the past decades. Everyone took to solve the puzzle. Some left for other remained impossible to get. Speed ? ?championships were made, movements ... The Magic Cube became one of the most popular objects of the 70s and 80s. If gleanings in your closet may find yourself with one half solved. But if you have lost, and you want a retro object on your desk, think about this Rubik Desk Tidy. Ideal to decorate your office table. And is that besides fulfilling its function, aesthetic level, with its bright colors, is very attractive. Already have pen and do not want to change? Then give her this item to your friend more intellectual. Surely after seeing him go straight to the store to buy a Rubik's Cube to solve. And remember that, in addition, this pen has its magnetic faces so the clips are in safekeeping. A treat for the desktop.